Uber CEO Travis Kalanick says he and his company get a bad rap for being aggressive because he learned to be fierce while running his last scrappy startup. But now that it creates 50,000 jobs a month and is a dominant player in on-demand car services, Kalanick said “You have to find different ways of doing things, of communicating, of understanding that people look at you as the big guy now, not the scrappy guy, and it requires a different way of running your business” today at TechCrunch Disrupt SF. Moderator and TechCrunch founder Michael Arrington [whose investment fund CrunchFund is an investor in Uber] jabbed Kalanick, asking if he thought he was like Darth Vader, or worse? 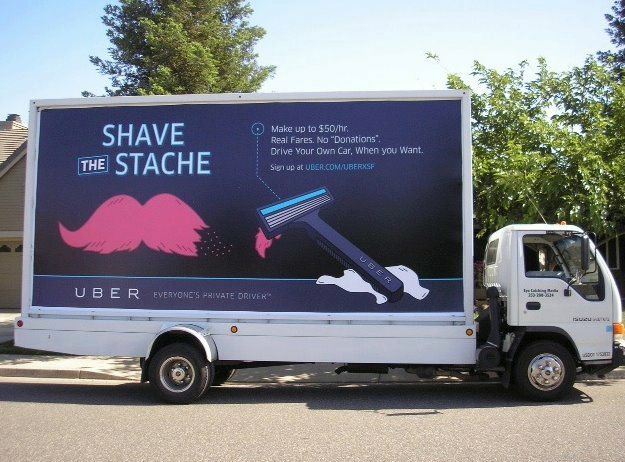 Much of that sour taste comes from Uber’s relentless recruitment of drivers working with its competitors, like the anti-Lyft “Shave The Stache” campaign shown below. But Kalanick, looking emotive and vulnerable for a moment, said people get that idea because they don’t know his backstory. When asked about Lyft and Uber’s M&A aspirations, Kalanick says the company hasn’t acquired any companies yet and hasn’t spent time thinking about it. Without acquisitions, Kalanick says Uber’s drivers number in the hundreds of thousands and it’s bringing on tens of thousands more each month. Kalanick still owns a car but says “I haven’t driven in like two years”. His goal with Uber is to become efficient enough that it can drop its prices below that of owning a car. Uber’s triumphs in ridesharing have given it the freedom to experiment and expand into new verticals. Its new API we broke the news on last month will let developers earn free rides by adding “Request an Uber” buttons and referring customers. This API could print money for the company by making Uber one touch away no matter what app you’re using. Uber is also experimenting with a courier service called UberRush, as well as UberFresh meal deliveries. If Uber can buck its perception as a ruthless, greedy company trying to put cabbies out of work and instead show the softer side of on-demand services, it could succeed far beyond taxis. It could get everything in the world where it needs to go.